After months of rumors, this morning it was announced that the Michelin Guide, the legendarily Eurocentric restaurant guidebook whose star system has the power to drive chefs to death is launching a Chicago edition this fall. 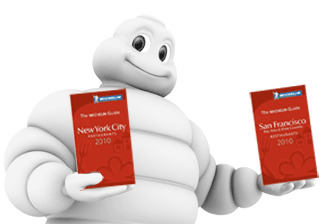 Let's be fair: Michelin has taken steps in recent years to cast off its stuffy, Francophilic image, launching San Francisco and New York editions (with attendant Twitter accounts), and even bestowing a star on a cheap Hong Kong dim sum joint. And let's face it, Michelin is pretty much the last bastion of completely anonymous restaurant criticism. Who knew inspectors had been evaluating Chicago restaurants for two years already? The job looks a bit lonely. So begins months of speculation on which chefs will get stars and which will get snubbed.